The Springburn Hall was a gift to the community from the Reid family of Neilson, Reid and Company. Constructed after an architectural competition. 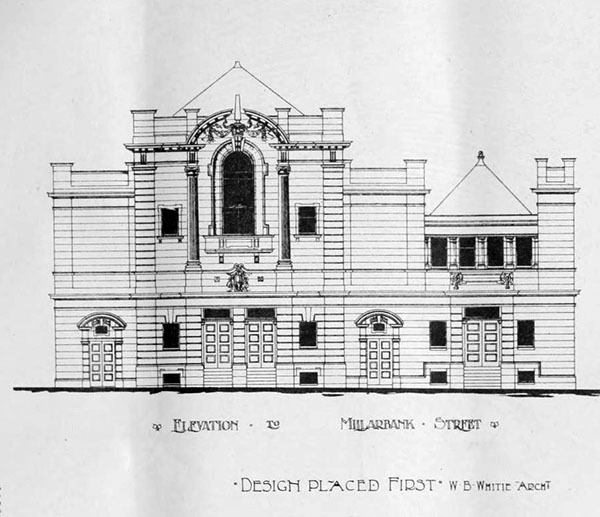 Designed in the Edwardian Baroque style by William B. Whitie who would subsequently design the Mitchell Library the hall was opened on May 16, 1902. The runner-up entries were by: Watson & Salmon; and Thomson & Sandilands. The building was used as Springburn Sports Centre from 1960, until it was closed by Glasgow District Council in 1985 due to a dry rot problem. A proposal in 2009 to convert the building into an office complex and childcare centre was awarded planning permission but never went ahead. The building was demolished, without warning, by Glasgow City Council in December 2012. “The committee, with the assessors and the curator, unanimously selected from a list of three the set of plans sent in by Sir. William B. Whitie, architect, as being best suited for the district. Their recommendation was made to the corporation, and was unanimously confirmed. 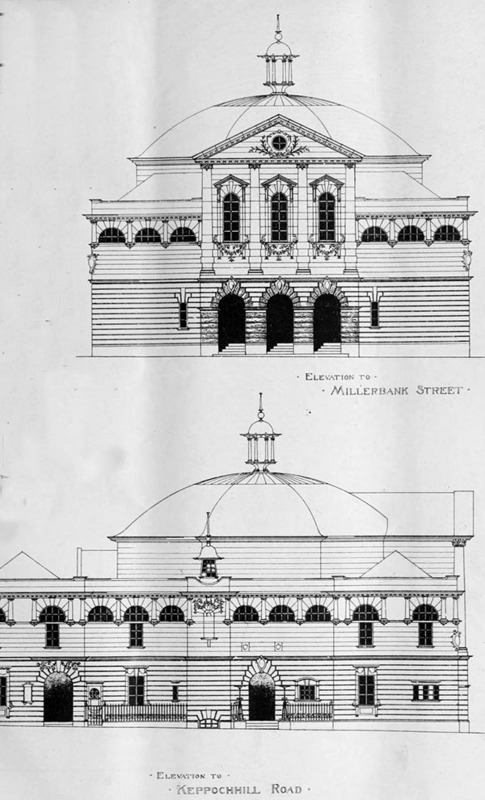 The building will occupy a prominent site at the comer of Millerbank-street and Keppochhill-road, and the drawings which illustrate this design show the two halls placed together longitudinally on the site, and so arranged that while the entrances, exits, and retiring rooms for each are both separate and distinct, they may be let together and used en suite when occasion requires. The level of the principal floor has been placed a few feet above the level of the adjoining streets, to permit the proper lighting and ventilation of rooms in basement. The main Hall measures 77ft. by 4Oft., exclusive of crush hall and orchestra, and provides comfortable seating accommodation for 1,20<,' persons. The principal entrances are from Millerbank-street, and open into a spacious crush hall, from which any part of the hall may be reached. Ample exit accommodation is provided at each end of the hall, both from area and gallery levels. The total widths of exits measured at the outer doorways is 27ft. in the clear— a space of more than 10ft. in excess of that demanded by the building regulations. In the dividing wall between the two halls are two sets of double doors, which will be opened when both halls are used en suite. The platform entrance is from Keppochhill-road, and communicates by means of a corridor under the platform with the retiring rooms which overlook the lane. On the ground floor a committee-room is shown, which will be used as a platform- or green-room, while immediately above are situated the dressing-rooms for the lady and gentlemen artistes. A staircase, starting from the platform corridor, gives access to these, and also the platform, from a half landing. An access to platform is also shown at south end of platform corridor. The platform entrance will also serve as entrance for reserved portion of area. Lavatory accommodation is provided to all retiring-rooms, and a public lavatory will communicate with the crushnail. There is a cloakroom in connection with the ladies' and gentlemen's retiring-rooms in basement, placed so that the attendant is able to overlook both of these rooms. Access to ladies' and gentlemen's rooms from crush-hall is by means of the north and south staircases respectively. In the basement under the main hall a large store for forms, Sec, is provided, together with three committee-rooms, which are placed so that they are lighted and ventilated to an area to Keppochhill-road. It is proposed that these rooms should be divided by movable partitions. Access may be had either from the platform entrance or the south exit in Millarbank-street. This allows these rooms to be let separately even when the main hall is occupied. The lesser hall measures 2ft. by 27ft., and provides seating accommodation for 408 persons. The principal entrance is from Millarbank-street, and from the entrance hall a staircase leads upward to the gallery and downward to basement. There are emergency exits at each side of the platform. These communicate with corridor which leads direct to lane. The artistes' room, with ladies' and gentlemen's lavatories, is situated in basement, and is reached by means of a stair from lobby on north side of platform. From this lobby a flight of steps leads up to platform level. The cloak-room accommodation is arranged with access from entrance hall, similar to, but on a smaller scale than, that for main hall. The kitchen is placed in the basement under lesser hall, and the necessary gas-cooking apparatus is indicated, while a lift for the convenience of purveyors is provided from the kitchen corridor to the service lobby at south side of platform. The corridors in basement are of ample width, and are so arranged as to facilitate communication with the various staircases. It is proposed to heat the building by low-pressure steam in pipes, coils, and radiators. Electric fans placed in roof will draw off the foul air, and fresh air will be admitted behind the heating coils. All sanitary appliances will be of the latest type. The main roofs will be carried on steel principals, and it is proposed that balconies should be supported on steel cantilevers built into the wall. The materials for the exteriors will be red freestone for masonry and green Westmoreland slates for roofs. The cubical contents of the whole building, calculated accurately in the manner required by the conditions, amount to 456,196ft. 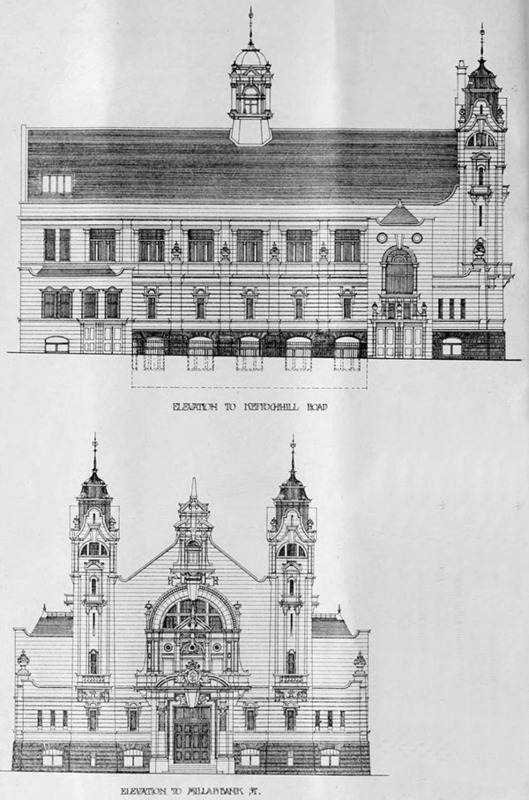 The elevations and view show the external treatment adopted. The work is to be proceeded with at once. Messrs. John Thomson and R.D. Sandilands, the authors of one of the two premiated designs, which we understand were placed equal in merit, have located their large hall 7ft. above the street level and the small hall about 7ft. below, in order that the big hall, which is the essential part of the scheme, should not be interfered with by the smaller hall and the committee rooms. The cloak-rooms are placed right and left of the principal entrance in Millerbank- street. The exits are numerous, and there are four staircases from the gallery — two at each end. The entrance-hall to the small assembly-room is reached by a flight of steps from Keppochhill-road. The artists’ rooms are placed next the platform, and are entered from the same thorough- fare. The front and side walls are intended to be built of ashlar. The back gable and all internal walls are proposed to be built in brick. Cast-iron pipes were suggested for all drains. Red pine to be used for joists, and white pine for the roof spars and sarking. The hall roof-trusses to be in steel built – up framings. Elterwater green slates are proposed for the roof coverings. The estimated cost is set down rather below the sum of £12,000.